Today marks the 38th day of our forty legislative days for the 2019 session. Sine Die - the final day of session - is next Tuesday, and we are in final deliberations on critical measures that will impact our state. Below I have included a recap of the last two weeks along with other updates from the Capitol. ​Health care continues to be the biggest topic of this year's legislative agenda. On Tuesday, the House passed Gov. Kemp's Patients First Act to give the Governor authority to explore and submit a Medicaid waiver proposal to the federal government for approval. The Kemp administration will now consider 1115 and 1332 waivers to find Georgia-centric solutions to lower costs and increase coverage for all Georgians. We also passed Senate Bill 118 - the Telehealth Act - to expand telehealth services in our state, ensure coverage and support patients and physicians as we grow this critical component of health care in our state. Additionally, we continue to explore the certificate-of-need process and regulations in Georgia, and there are several measures in the House and Senate that remain active on this topic. On Monday, the Senate passed House Bill 217, my first bill, 45-4 with overwhelming bipartisan support. HB 217 will enable syringe services programs in Georgia, which will help us chip away at the opioid crisis, reduce the spread of HIV and Hepatitis C in our state, protect our first responders from needlestick injuries, and save all Georgians healthcare costs. It now goes to Gov. Kemp's desk. Another bill that is part of our health care package is Senate Bill 16 - which has now passed the Senate and House. SB 16 will help our state license qualified doctors more efficiently and would help all Georgians receive greater access to health care without having to travel to do so. The House also passed Senate Bill 18, or the “Direct Primary Care Act,” which would give Georgians the option to keep health care directly between the patient and a doctor without requiring insurance - creating an alternative avenue towards efficient and affordable health care by removing unnecessary red tape. This week, the House voted to approve Senate Bill 158 - the Anti-Human Trafficking Protective Response Act - to extend protection for victims, or suspected victims, of human trafficking through referral to a certified victim services organization. The bill would also raise the current age of a minor and would enforce stricter penalties on the perpetrator in addition to several other important steps to address this growing issue in our state. Last week, we unanimously passed Senate Bill 167, a bill that originated with Oconee Co.'s own Reverend Joel & Jennifer Shinpoch. The Shinpochs came to the Capitol to support legislation increasing the amount of preference given to foster parents when the court has exhausted its options for a child to be placed with a family member or relative. This bill would give a greater emphasis on the importance of children being placed with a caregiver who tends to their emotional and physical needs when it’s in the best interests of those children. We have just three legislative days remaining, but many of the most important bills of this legislative session remain active. We anticipate voting on dozens of bills in the last few days, and, as always, your input is most appreciated. 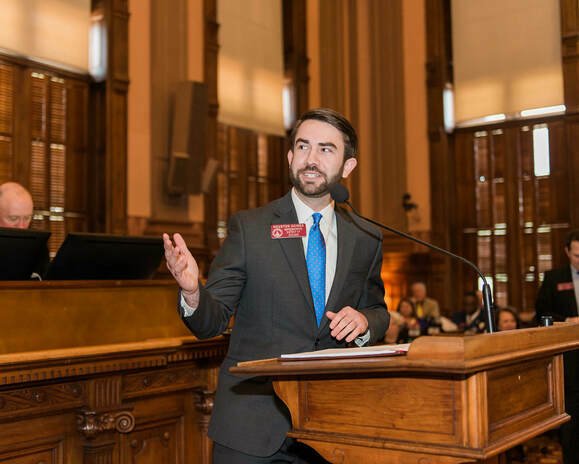 HB 588 [author] -- Non-refundable earned income tax credit: As previously mentioned, I introduced HB 588 to create a non-refundable earned income tax credit program in Georgia. This legislation would mean a $130 million tax cut for 700,000 lower and middle income Georgians. This bipartisan legislation is an item we hope to move forward in 2020 along with other tax reform related measures, including reducing the state income tax. HB 217 [author] -- Syringe Services Programs: As mentioned above, this life and cost saving measure has now passed the Senate and House and heads to Gov. Kemp's desk. HB 62 [co-sponsor] -- Margie's Law: This is another measure we've previously discussed in our legislative update. This bill has now passed the Senate and will move to Gov. Kemp's desk for his signature. HB 520 [author] -- Moving nonpartisan elections back to November: This bill would move nonpartisan local and judicial elections from the primary back to the general election in November to increase turnout in these important elections and reduce the seven month lame duck period. Unfortunately, we were unable to move this legislation this year and have missed Crossover, but we hope to continue working on this. HB 459 [co-sponsor] -- Bus driver safety: Current law only requires public school bus drivers to have their drivers background history checked once at the beginning of employment. This measure will ensure regular checks for driver history to ensure our community's children are kept safe and secure. This has now passed the House and Senate. I continue to enjoy welcoming many constituents to the Capitol. In the past two weeks, we've had dozens of visitors from the district. In the remaining days of session, we would love to have you join us, as well.